This anthology of prose stories from IDW, which I'm currently reading, has at least five stories with crossovers. In Don Webb's story "Nazis in Paradise," the languages spoken by a linguist on an expedition to Tibet are listed, including Tcho-Tcho, the name of a race in Cthulhu Mythos fiction by August Derleth. 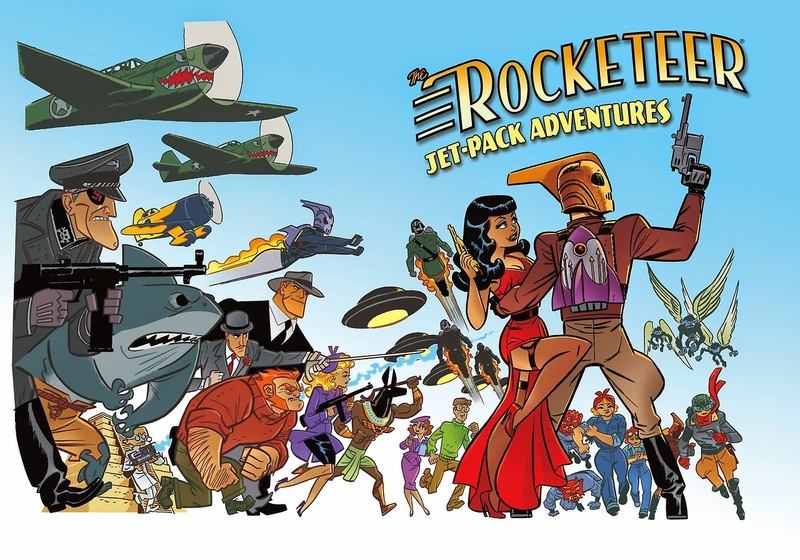 Gregory Frost's "Farewell, My Rocketeer" has an appearance by Simon Templar (aka the Saint) and Patricia Holm, though they are only referred to by their first names. In Simon Kurt Unsworth's "Atoll of Terror," a British scientist working for the Nazis says, "Those sanctimonious fools drove me out [of England], just like Moreau before me, another visionary exiled for attempting to expand the scope of mankind." Near the end of Nancy A. Collins' "Codename: Ecstasy," Cliff tells Hedy Lamarr, "I know a guy called Doc who's big on rehabilitation through applied brain surgery. If it works on criminals, it should work on Nazis, too." Lisa Morton's "The Rivet Gang" has Ham and Monk appearing; surprisingly, they're actually referred to by those names, though Doc Savage is only identified as the Big Boss. So Hedy Lamarr appears in one of the stories. She was an interesting person. Who knew that she was an inventor. There are actually a few historical characters appearing in the various stories, including Zane Grey, Howard Hughes, Johnny Weissmuller, and other. I actually read about it years ago. I know Howard Hughes was the inventor of the jet pack in the movie (instead of Doc). I always planned to read the original comic book stories, but haven't gotten around to it yet. I've always assumed that the reason for this was because A) rights issues, and B) in the comic Hughes is who Cliff (wrongly) assumed that Ham and Monk worked for. Anyway, this is the first I've heard of this collection, but I definitely plan to seek it out. Thanks for bringing it to my attention! The comics, ESPECIALLY Dave Stevens' original two stories, are well worth reading. IDW's reprinted the Stevens tales in hardcover, softcover, and e-book formats. Everything I've heard about them has been good, but I just never got around to picking them up.